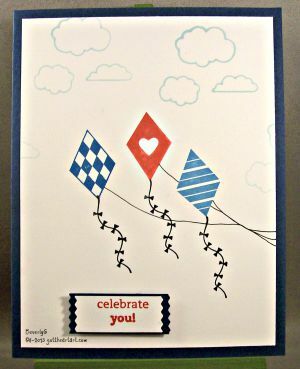 This is all one stamp set Stampin' Up Send Me Soaring. I've loved this set sent it first came out back in 2012 and have used it quite a bit. Very apt for this weeks challenge Ride the Wind Day, the 300th challenge at Crazy 4 Challenges. That's quite and accomplishment, Well Done!!!! I was also fun using the Stampin' Up Washi Tape punch to sit the sentiment on.It punches longer, but you can punch it then stick the paper back in and punch it shorter. There's a lot of punches you can make more versatile than just punching the picture on the punch. This challenge started Saturday, I think there is still time to enter. I always give you a clickable link under whatever project I'm showcasing. 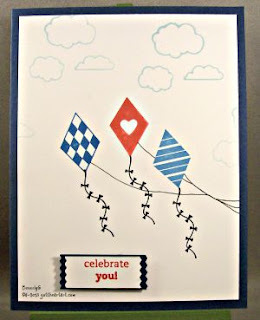 Click over and give your windy stamps a whirl.